Brad Marchand has a goal and an assist and Tuukka Rask makes 37 saves as gets past New Jersey and has at least one point in 17 straight games. 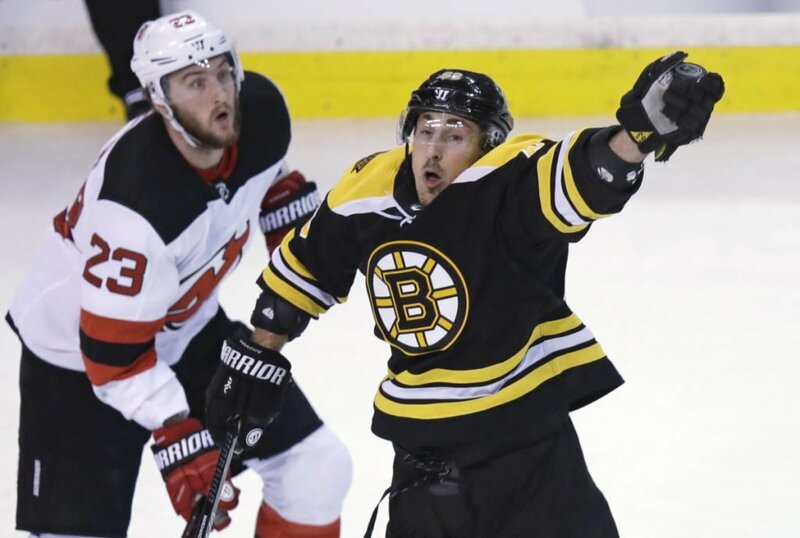 BOSTON — Brad Marchand had a goal and an assist, and the Boston Bruins continued surging toward the All-Star break with a 3-2 victory over the New Jersey Devils on Tuesday night. New Jersey outshot Boston 20-9 in the first period, but couldn’t get anything past Rask. After a wild second period, Rask stopped 12 more shots. Marchand gave the Bruins the lead on a breakaway goal, his 21st, with 33 seconds left in the middle period. Marchand also assisted on Bergeron’s power-play goal with 7:07 to go in the second that tied it 2-all. It was the 20th goal of the season for Bergeron, who joined linemates Marchand and David Pastrnak to reach 20 goals. Nash scored Boston’s first goal 7:03 into the second, tying it after Wood broke the scoreless tie with a goal at 2:05. Severson scored for New Jersey two minutes later. NOTES: Schneider, who was sidelined two of the previous three games with an illness, left after the second period. … Marchand’s goal and assist gave him nine points in his last four games. … All-Star left wing Taylor Hall sat out his second straight game for the Devils with a hand injury. … Boston was without defenseman Charlie McAvoy, who had a procedure to correct an abnormal heart rhythm on Monday and is expected to miss two weeks.